Tristan Nicholson and Amber Rainbird. Photo by Chloe Gleeson. Under 6 Red played New Norfolk Under 6 Black and it was a good game all round. Special thanks to Zack and Lucas for sharing the game with us from Under 6 Black. A good team effort all round. Under 6 Black put in a great effort. Special mention to Lucas and Zack for great sportsmanship and to our youngest player Lewis who shows improvement each week. Goal kickers: Vincent 4, James 3, Hemi 2, Shaun and Zack. Well done boys. Under 7 Red played a fast-paced game against Dominic at Tynwald Park. A Super effort by all, with a special mention to Lilly for her constant improvement and really starting to get in amongst it all, and also to Anthony for his great work after copping a ball to the face which knocked out his wobbly tooth! Under 7 Black gave a fantastic team effort against Holy Rosary. All players have improved so much this season. An outstanding game by Rodney Browning scoring his first two goals. Special mention to Amber Rainbird for scoring two goals and Tristan Nicholson scoring one. Keep up the awesome work guys. Under 8 Red played a great game against a friendly Bagdad side. Awesome work by all players with goals to Jack, Nayte and J'Khobi. Declan, Jacob and Josh tried hard all game. Thanks to Kiara for her excellent goalie work and to both Kiara and Josh for filling in for us. Under 8 Black once again played a hard game with all learning more each week. 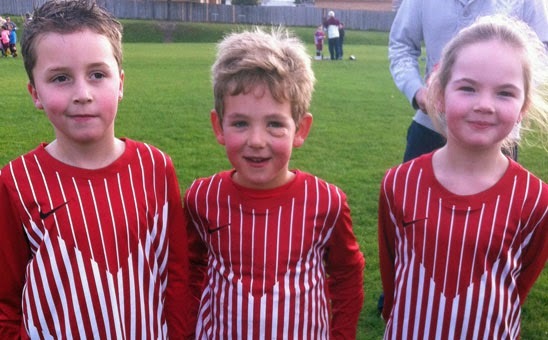 Mikayla and Jack scored well-earned goals, while Joshua and Jess tried very hard in the goals. Caitlin, Mia, Astrid and Jacob tried hard to stop a very good team in Brighton White. Thanks to Jack, Nayte and Declan for filling in as substitutes. With Jack and Joshua playing two games, both boys were very tired. Under 9 played a great game against Brighton. Well done Maiken for his goal. The other goal was an own goal. Fantastic work by Abby and Caleb in goals with some great saves. Jenny and Caylin are both gaining more confidence as our newest players. Well done team. Under 10 had a 9-0 win against Derwent United on a fantastic morning for soccer. Our goal-kickers were Aidan 3, Kiara 2 and one each to Luke, Ostyn, Brock and Jacob. Goal keepers were Luke and Alex B. Special mention to Alex B and Maddy who each played a half for Derwent with fantastic sportsmanship playing as hard for Derwent as they do for New Norfolk. Also well done to Alex G and Freya who ran hard all game. Well done everyone, you should be very proud. Under 11 defeated Derwent United 3-1 at Weily Park on Friday night. Once again a fantastic contribution by all team members. Goal scorers were Levi 2 and Brayden. Well done Under 11. Under 14 defeated New Town White by four goals (6-2). A fast-paced game and great team work saw us leading by a goal in the first half. Nathan Coleman had a fantastic run from the backline which resulted in a penalty and was kicked right on the half-time whistle. Liam Kalbfell having played well in goals came out in the second half to kick two goals, one being from a corner kick in. Excellent skills from the backline through to the fast-paced forwards allowed Braydon Wilson to score three goals. This was the best game I have seen this team play and they all should be proud of themselves!! Well done guys and girls. Under 16 played Huonville at Tynwald Park and although they lost they kept Huonville goal-less in the second half because of good team structure. Sam scored the goal for New Norfolk. Seniors – New Norfolk Division 4 ended their run of matches against the top four teams with an away game against second on the ladder Derwent. The team started well, scoring the first goal through Luke Slater but lost two goals by half time. The second half was an end-to-end affair with both sides going close. New Norfolk almost snatched a well-deserved draw after Josh Young’s free kick rattled the crossbar and bounced down and eventually out of danger. The defence put on an incredibly solid performance to continually deny the prolific Derwent strikers. This week the team are at home at Tynwald Park versus University at 2.30pm, come along and show your support.